While tests have been done on experimental versions of the drive — with low energy inputs resulting in a few micronewtons of thrust (about as much force as the weight of a penny) — The first peer-reviewed paper has only been recently accepted, and none of the findings from other tests have ever been published in a peer-reviewed journal. It’s possible some positive thrust results may have been caused by interference or an unaccounted error with test equipment. The fact that NASA Eagleworks’ paper has been reportedly accepted by peer review and will be published in AIAA Journal of Propulsion and Power does add quite a bit of legitimacy to these claims, however. Although there’s been much skepticism regarding the EmDrive prior to the Eagleworks paper, it’s important to note that there’s been a number of people who have tested the drive and reported achieving thrust. In 2001, Shawyer was given a £45,000 grant from the British government to test the EmDrive. His test reportedly achieved 0.016 Newtons of force and required 850 watts of power, but no peer review of the tests verified this. It’s worth noting, however, that this number was low enough that it was potentially an experimental error. In 2008, Yang Juan and a team of Chinese researches at the Northwestern Polytechnical University allegedly verified the theory behind RF resonant cavity thrusters, and subsequently built their own version in 2010, testing the drive multiple times from 2012 to 2014. Tests results were purportedly positive, achieving up yo 750 mN (millinewtons) of thrust, and requiring 2,500 watts of power. 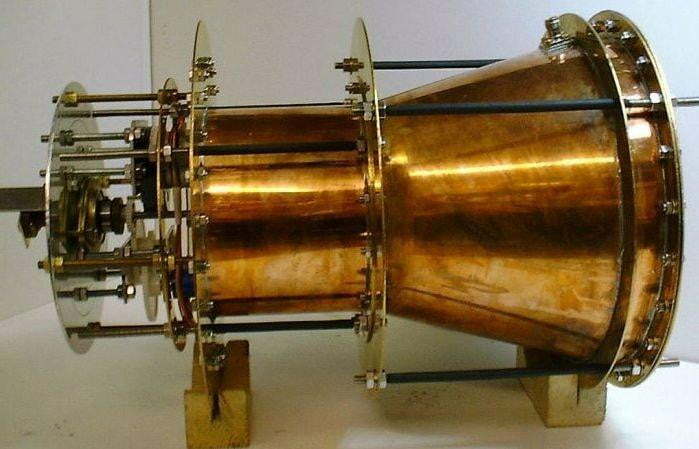 In 2014, NASA researchers, tested their own version of an EmDrive, including in a hard vacuum. Once again, the group reported thrust (about 1/1,000 of Shawyer’s claims), and once again, the data was never published through peer-reviewed sources. Other NASA groups are skeptical of researchers’ claims, but in their paper, it is clearly stated that these findings neither confirm nor refute the drive, instead calling for further tests. In 2015, that same NASA group tested a version of chemical engineer Guido Fetta’s Cannae Drive (née Q Drive), and reported positive net thrust. Similarly, a research group at Dresden University of Technology also tested the drive, again reporting thrust, both predicted and unexpected. Yet another test by a NASA research group, Eagleworks, in late 2015 seemingly confirmed the validity of the EmDrive. The test corrected errors that had occurred in the previous tests, and surprisingly, the drive achieved thrust. However, the group has not yet submitted their findings for peer review. It’s possible that other unforeseen errors in the experiment may have cause thrust (the most likely of which is that the vacuum was compromised, causing heat to expand air within it testing environment and move the drive). Whether the findings are ultimately published or not, more tests need to be done. That’s exactly what Glenn Research Center in Cleveland, Ohio, NASA’s Jet Propulsion Laboratory, and Johns Hopkins University Applied Physics Laboratory intend to do. For EmDrive believers, there seems to be some hope. In mid-2016, a new theory was put forth by physicist Michael McCulloch, a researcher from Plymouth University in the United Kingdom, which may offer an explanation of the thrust observed in tests. McCulloch’s theory deals with inertia and something called the Unruh effect — a concept predicted by relativity, which makes the universe appear hotter the more you accelerate, with the heat observed relative to the acceleration. McCulloch’s new theory deals with the unconfirmed concept of Unruh radiation, which infers that particles form out of the vacuum of space as a direct result from the observed heating of the universe due to acceleration. This theoretical concept largely fits into our current understanding of the universe and predicts the results of inertia we currently observe, albeit with one notable exception: small accelerations on the scale of about what has been observed while testing the EM Drive. This acceleration comes as a result of the Unruh radiation particles, whose wavelengths increase as acceleration decreases. Unruh particles at different wavelengths would have to fit at either end of the EM Drive’s cone, and as they bounce around inside the cone, their inertia would change as well, which would ultimately result in thrust. McCulloch’s theory is, admittedly, a bit difficult to parlay into succinct layman’s terms. If you’re curious and want to delve into further reading on the theory, you can read McCulloch’s entire paper discussing his theory here. The point here is that, should the Unruh Effect and Unruh Radiation be confirmed, it offers an entirely plausible explanation for the EM Drive’s seemingly heretofore impossible thrust observations. This will require further research and experimentation, and gives the propulsion system even more momentum for testing. It’s easy to see how many in the scientific community are wary of EmDrive and RF resonant cavity thrusts altogether. But on the other hand, the wealth of studies raises a few questions: Why is there such a interest in the technology, and why do so many people wish to test it? What exactly are the claims being made about the drive that make it such an attractive idea? While everything from atmospheric temperature-controlling satellites, to safer and more efficient automobiles have been drummed up as potential applications for the drive, the real draw of the technology — and the impetus for its creation in the first place — is the implications for space travel. Spacecraft equipped with a reactionless drive could potentially make it to the moon in just a few hours, Mars in two to three months, and Pluto within two years. These are extremely bold claims, but if the EmDrive does turn out to be a legitimate technology, they may not be all that outlandish. And with no need to pack several tons-worth of fuel, spacecraft become cheaper and easier to produce, and far lighter. For NASA and other such organizations, including the numerous private space corporations like SpaceX, lightweight, affordable spacecraft that can travel to remote parts of space fast are something of a unicorn. Still, for that to become a reality, the science has to add up. Shawyer is adamant that there is no need for pseudoscience or quantum theories to explain how EmDrive works. Instead, he believes that current models of Newtonian physics offer an explanation, and has written papers on the subject, one of which is currently being peer reviewed (separate from the Eagleworks paper). He expects the paper to be published sometime this year. While in the past Shawyer has been criticized by other scientists for incorrect and inconsistent science, if the paper does indeed get published, it may begin to legitimize the EmDrive and spur more testing and research. Spacecraft equipped with a reactionless drive could potentially make it to the Moon in just a few hours. Despite his insistence that the drive behaves within the laws of physics, it hasn’t prevented him from making bold assertions regarding EmDrive. Shawyer has gone on record saying that this new drive produced warp bubbles which allow the drive to move, claiming that this is how NASA’s test results were likely achieved. Assertions such as these have garnered much interest online, but have no clear supporting data and will (at the very least) require extensive testing and debate in order to be taken seriously by the scientific community — the majority of which remain skeptical of Shawyer’s claims. Hopefully, with this new peer reviewed paper, more EmDrive tests will be undertaken, helping elucidate just how this thing works. Colin Johnston of the Armagh Planetarium wrote an extensive critique of the EmDrive and the inconclusive findings of numerous tests. Similarly, Corey S. Powell of Discovery wrote his own indictment of both Shawyer’s EmDrive and Fetta’s Cannae Drive, as well as the recent fervor over NASA’s findings. Both point out the need for greater discretion when reporting on such instances. Professor and mathematical physicist, John C. Baez expressed his exhaustion at the conceptual technology’s persistence in debates and discussions, calling the entire notion of a reactionless drive “baloney.” His impassioned dismissal echoes the sentiments of many others. NASA Eagleworks’ paper opens the door for better understanding of the technology, and for further refinement of it. A demonstrable, working EmDrive could open up exciting possibilities for both space and terrestrial travel — not to mention call into question our entire understanding of physics.